Are serial killers born defective or created from the circumstances of their lives? “Nailbiter” attempts to explore this age-old question and introduces the reader to the town of Buckaroo, Oregon and its curse of being the birthplace of evil. This isn’t any ordinary small town. It’s bred over a dozen serial killers and scared off many of its population. Writer Joshua Williamson tells a unique horror story brimming with fun and mystery while commenting on the ubiquity of serial killers in the popular culture and society’s obsession with the macabre. 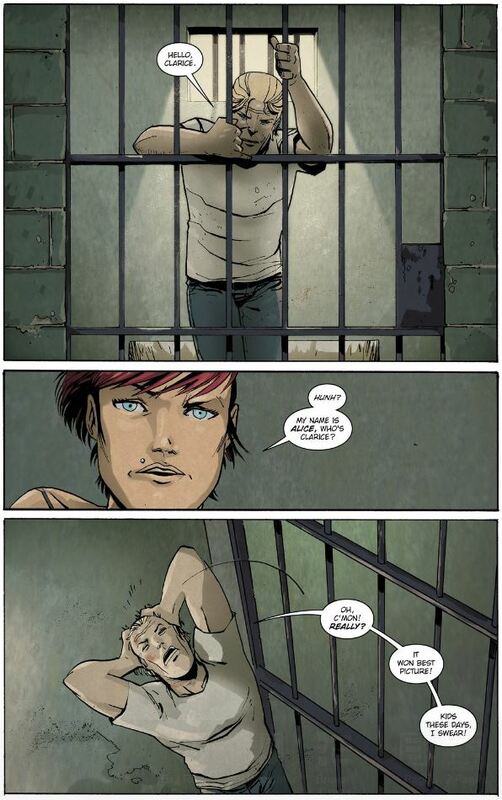 Artist Mike Henderson and colorist Adam Guzowski are appropriate partners in crime and bring Buckaroo and its inhabitants to sinister life. From the very first panel, the book establishes a creepy horror film feel. A cop car pulls up to a house with lights flashing (beautifully rendered by Guzowski) and the mystery begins. Detective Eliot Carroll, who has been investigating the reason why Buckaroo breeds serial killers, has gone missing. Before disappearing, Carroll had asked his friend Officer Nicholas Finch to meet with him in Buckaroo because Finch had special “skills” that could help unravel the mystery. Finch, who has a dark secret, must work with the local Sheriff Shannon Crane (who also has secrets of her own) in deducing the mystery of Carroll’s disappearance and the shocking events that are about to transpire. Buckaroo is the perfect setting for a horror tale. A small town with secrets hiding in every crevice is a perfect place for Williamson to allow ambiguity. Why do the remaining citizens of Buckaroo remain somewhere that has scared off much of its town folk? Empty streets, pouring rain, and a serial killer museum are ingredients of a creepy brew that would scare the sane away in droves. Williamson, along with Henderson, make the town of Buckaroo a character all its own. A horror story doesn’t simply require a spooky setting. It also needs the specter of the unexplained looming over it. 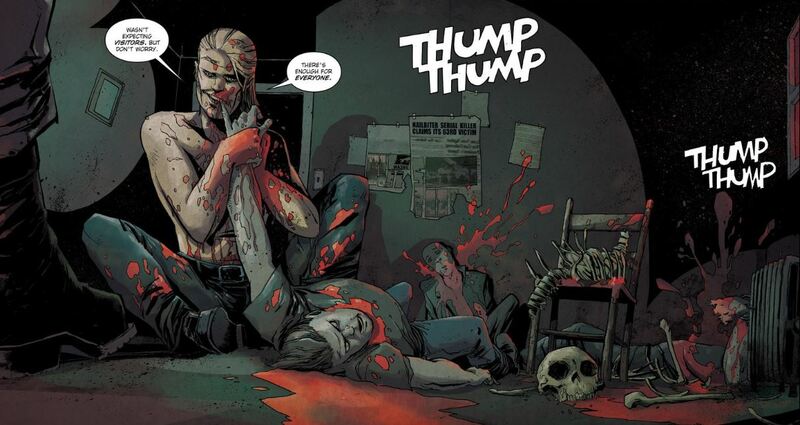 Williamson is adept at nailing this by building mystery and tension in “Nailbiter” and, through these first five issues, reveal to the reader just enough to keep them coming back for more. Characters may seem either innocent or guilty and might be more complex than at first glance. People and situations may not be what they appear to be. Twists and turns occur that imply a much deeper conspiracy is afoot. Mystery and horrific scenes (of which there are plenty in this book) may be essential characteristics of a horror yarn. Yet another one must be present as well: suspense. Although easy to create on film, it’s much more difficult to build suspense on the page. Henderson is a master of tension with his work in “Nailbiter” and will have the reader shocked with what he puts on the page. One particularly suspenseful scene occurs in the mortician’s examining room. While Morty the mortician updates Finch and Crane on the results of a body’s examination, the lights flicker on and off. One panel is pitch black while the next has them continue their conversation. 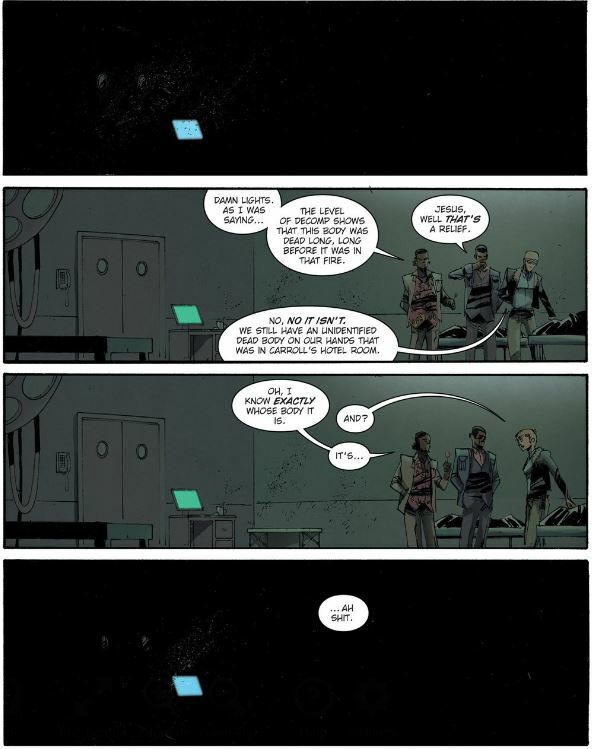 The eerie glow of a computer in the dark haunts the scene while a figure in white slowly gets closer as the panels progress. Henderson brings a cinematic touch to this scene and succeeds in making the reader hold on to the edge of their page. Expressive coloring is vital for a horror comic book. How will the blood and gore look realistic without great coloring? Guzowski brings his skills to “Nailbiter” and does outstanding work with his color palette, whether the scene calls for being grotesque or subtle. When the Nailbiter chews on fingers, the blood drips with a deep, dark red. A flashback scene in an interrogation room is a rich black, white, and gray. Guzowski, as mentioned in previous paragraphs, brings an eerie, yet realistic glow to lights of any kind. A touch of the playful is evident in both the writing and the art. A knowing nod to past horror films, such as “Silence of the Lambs”, beckons the reader that much deeper into the story. They know about these stories and tropes and, in this volume and future issues, must wrestle with horror “truths” and Williamson’s upending of those expectations in the story. Guzowski, in a subtly funny and horrific scene, has a panel of a sliced face lead to a new scene and new panel of a knife and fork slicing into a bloody piece of steak. By having some levity in the book, no matter how sadistic, Williamson and Guzowski transform the story into something much richer. You’ll even discover how many people a killer must kill in order to be “classified as a serial killer”: “only” five. The first volume of “Nailbiter” is an awesome opening to a horror tale that has great promise. Williamson is slowly building his story and the reader can pick up on this when rereading this volume. Hints are placed in each issue that are paid off in the future. With only five issues, the team of Williamson, Henderson, and Guzowski reels in readers with a tale that has only begun to intrigue and introduce them to the dark side of a little town named Buckaroo.